2 breech. As improved security tools have become available, SETMA CIO has upgraded our system to improve the security. Two Factor Authentications Two factor authentication means the provider has to have something he/she physically possesses combined with something he/she knows. The physical device is called a smart card, which has a small computer chip which is programmed and which is tied to a specific user s account. The something you know is similar to a traditional password. Someone can steal your smart card, but if they don t have your password it is worthless. Conversely, they can know your password, but unless they have the physical smart card it does them no good. 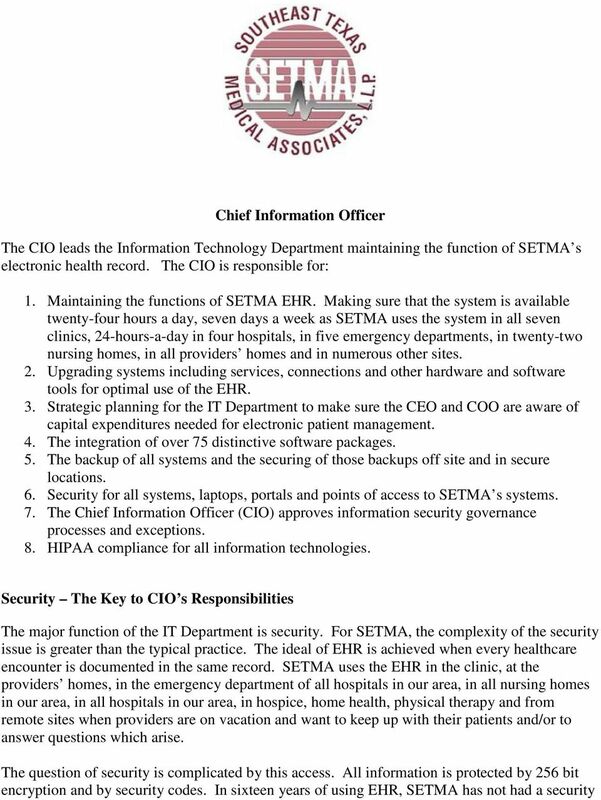 Currently, neither HIPAA nor MU require two-factor authentication but SETMA believes that in the future it will be. SETMA has a security policy that requires employees to report a misplaced, lost or stolen card. When a card is reported missing, SETMA s IT Department can inactivate that card rendering it useless and our system safe. 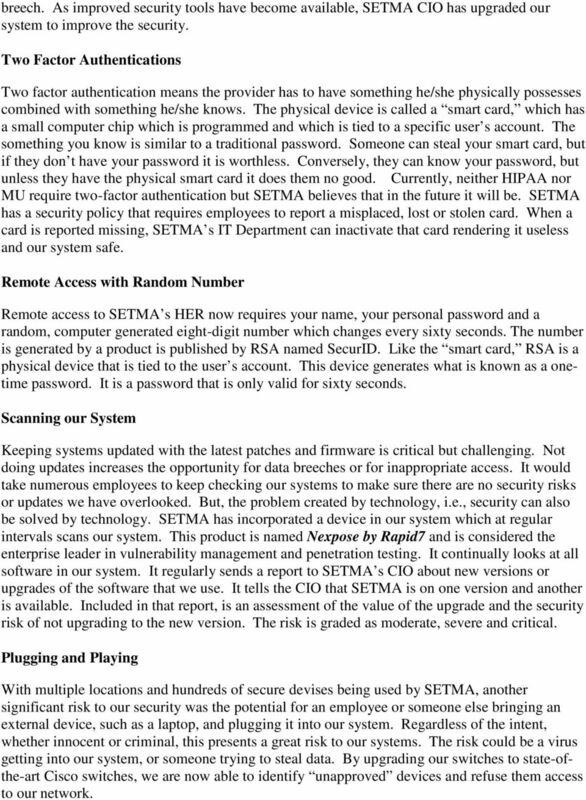 Remote Access with Random Number Remote access to SETMA s HER now requires your name, your personal password and a random, computer generated eight-digit number which changes every sixty seconds. The number is generated by a product is published by RSA named SecurID. Like the smart card, RSA is a physical device that is tied to the user s account. This device generates what is known as a onetime password. It is a password that is only valid for sixty seconds. Scanning our System Keeping systems updated with the latest patches and firmware is critical but challenging. Not doing updates increases the opportunity for data breeches or for inappropriate access. It would take numerous employees to keep checking our systems to make sure there are no security risks or updates we have overlooked. But, the problem created by technology, i.e., security can also be solved by technology. SETMA has incorporated a device in our system which at regular intervals scans our system. This product is named Nexpose by Rapid7 and is considered the enterprise leader in vulnerability management and penetration testing. It continually looks at all software in our system. It regularly sends a report to SETMA s CIO about new versions or upgrades of the software that we use. It tells the CIO that SETMA is on one version and another is available. Included in that report, is an assessment of the value of the upgrade and the security risk of not upgrading to the new version. The risk is graded as moderate, severe and critical. Plugging and Playing With multiple locations and hundreds of secure devises being used by SETMA, another significant risk to our security was the potential for an employee or someone else bringing an external device, such as a laptop, and plugging it into our system. Regardless of the intent, whether innocent or criminal, this presents a great risk to our systems. The risk could be a virus getting into our system, or someone trying to steal data. By upgrading our switches to state-ofthe-art Cisco switches, we are now able to identify unapproved devices and refuse them access to our network. 3 Log of Activity With a paper medical record, there is no way to know who has looked at a record. With a robust EHR however, it is possible to know everyone who has looked at, accessed or entered data into a chart. With SETMA s state-of-the-art EHR, an electronic log is kept of all activities related to a patient s record. In the past several years, SETMA had occasion to need to know if a particular record had been inappropriately accessed by another person. We are so serious about this issue that typically, even when there is a legitimate need to know something about a record, if that need is not involving patient-care or safety, that chart is not looked at without legal counsel and direction from counsel. In the case above, it was reassuring to discover that no one had looked at or accessed that chart inappropriately. SETMA has upgraded that ability. While various parts of our system created a log of activity, we did not have a cumulative log over our entire system. In our security analysis, we discovered that that was a HIPAA requirement and we have remedied that. 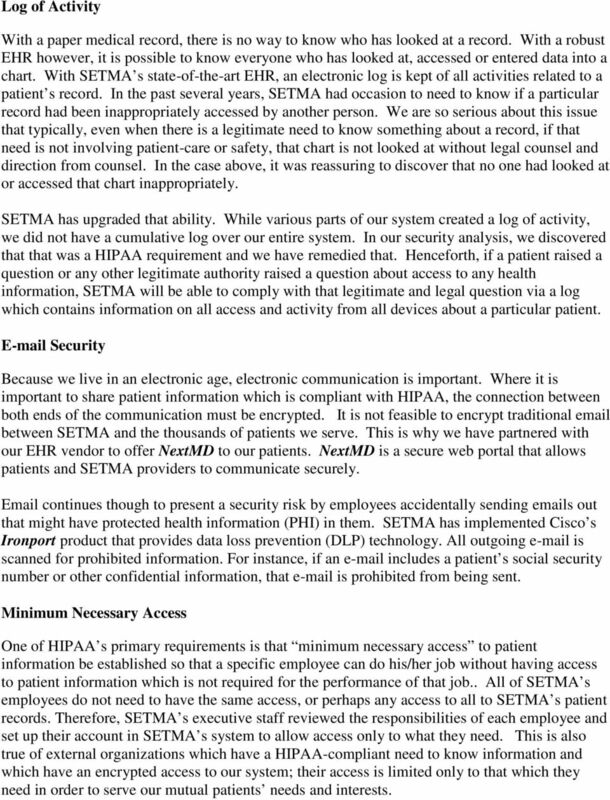 Henceforth, if a patient raised a question or any other legitimate authority raised a question about access to any health information, SETMA will be able to comply with that legitimate and legal question via a log which contains information on all access and activity from all devices about a particular patient. Security Because we live in an electronic age, electronic communication is important. Where it is important to share patient information which is compliant with HIPAA, the connection between both ends of the communication must be encrypted. It is not feasible to encrypt traditional between SETMA and the thousands of patients we serve. This is why we have partnered with our EHR vendor to offer NextMD to our patients. NextMD is a secure web portal that allows patients and SETMA providers to communicate securely. continues though to present a security risk by employees accidentally sending s out that might have protected health information (PHI) in them. SETMA has implemented Cisco s Ironport product that provides data loss prevention (DLP) technology. All outgoing is scanned for prohibited information. For instance, if an includes a patient s social security number or other confidential information, that is prohibited from being sent. Minimum Necessary Access One of HIPAA s primary requirements is that minimum necessary access to patient information be established so that a specific employee can do his/her job without having access to patient information which is not required for the performance of that job.. All of SETMA s employees do not need to have the same access, or perhaps any access to all to SETMA s patient records. Therefore, SETMA s executive staff reviewed the responsibilities of each employee and set up their account in SETMA s system to allow access only to what they need. This is also true of external organizations which have a HIPAA-compliant need to know information and which have an encrypted access to our system; their access is limited only to that which they need in order to serve our mutual patients needs and interests. 5 to support the SETMA Information Security Program and to comply with applicable federal and state regulations. Facilities in states with additional requirements must gain SETMA Corporate assistance to implement policies that address state-specific requirements. Information Security Program Elements The SETMA Information Security Program consists of policies, procedures and standards provided by the Corporate Information Technology Department. 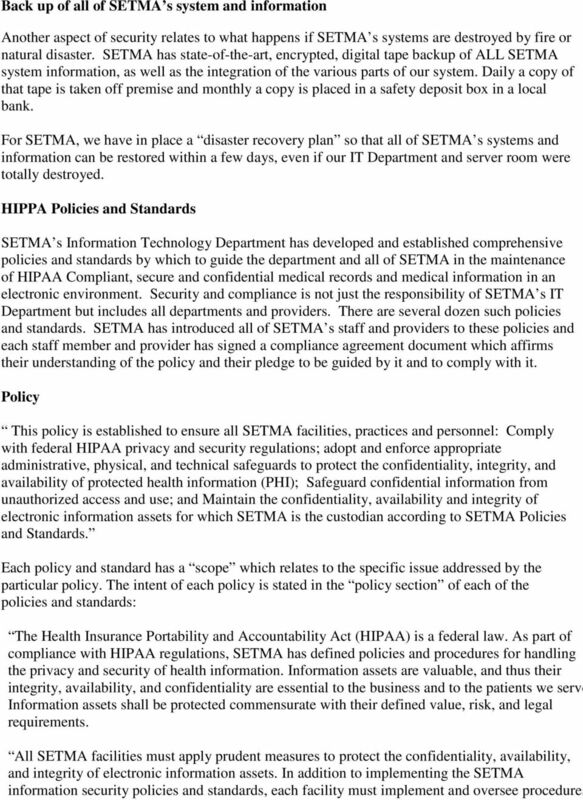 Each SETMA facility will implement the Corporate Information Security Program and any additional facility-specific information security procedures necessary to support compliance with applicable federal and state requirements. SETMA Policies include an explanation of the penalty for non-compliance. This section of the policy manual addresses: Compliance Violations Suspected violations of this policy must be handled in accordance with this policy, the SETMA Code of Conduct, and with SETMA Compliance Policies. Each facility must implement and enforce the SETMA process for promptly reporting violations. Violations must be reported to the Facility Security Officer, Facility Privacy Officer and the Corporate Security Officer, as warranted. (See policy on Security Incident Reporting and Response). Policy Exceptions The Chief Information Officer (CIO) approves information security governance processes and exceptions. Exception approval is based upon risk management reflecting appropriate, reasonable, and effective information security measures for a given situation. 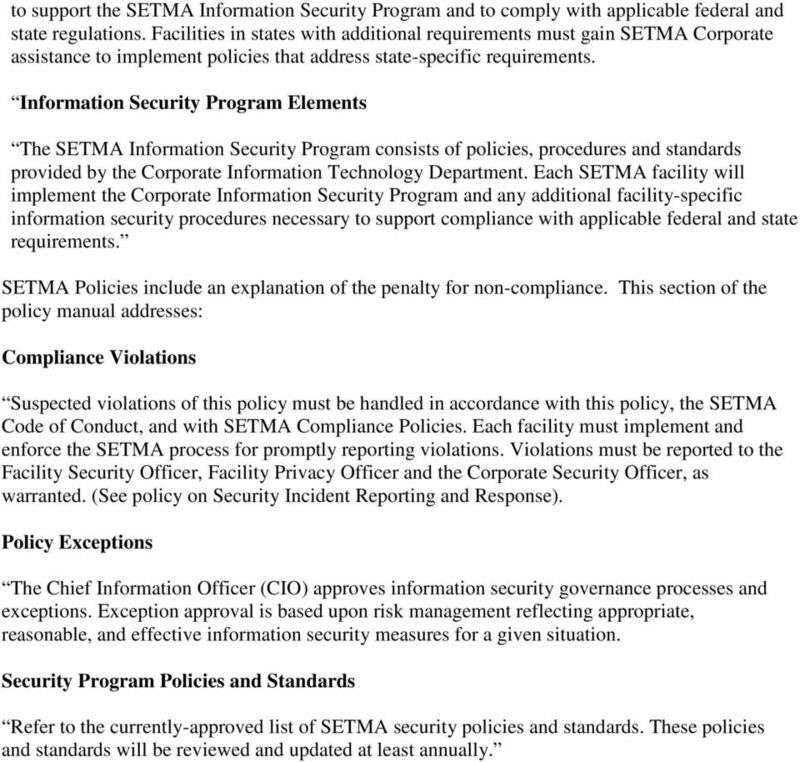 Security Program Policies and Standards Refer to the currently-approved list of SETMA security policies and standards. These policies and standards will be reviewed and updated at least annually. A. ACCOUNT INFORMATION NETWORK SECURITY & PRIVACY SUPPLEMENT THIS SUPPLEMENT IS PART OF THE APPLICATION, INCLUDING A RENEWAL APPLICATION, SUBMITTED BY OR ON BEHALF OF THE APPLICANT FOR THE PROPOSED INSURANCE. SUPPORTING HIPAA COMPLIANCE THROUGH MANAGED HOSTING.